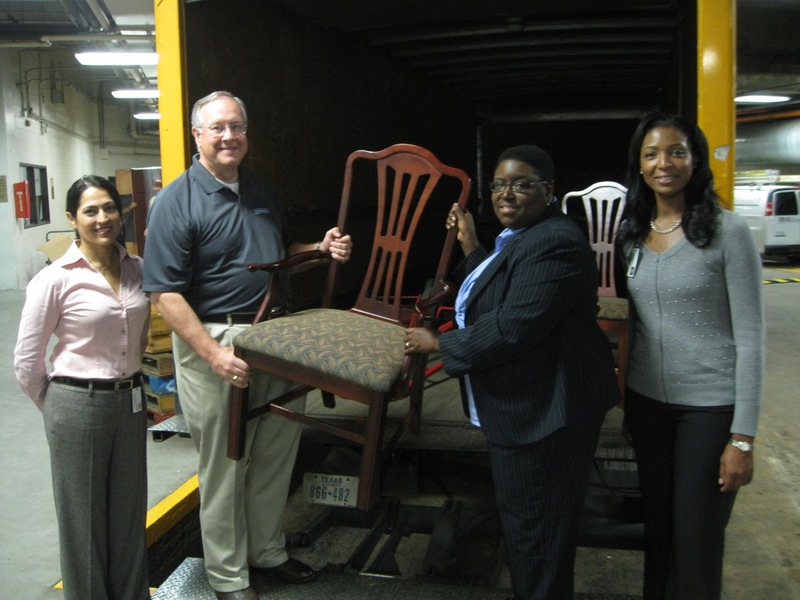 In the center, Downey Bridgwater, Comerica’s Houston market president, and Vanessa Reed, Comerica’s South Texas Community Reinvestment manager, load one of dozens of chairs into a moving van. They are flanked by Veronica Ruiz (left), manager of HISD’s Warehouse Furniture Operations, and Nicole Ware Smith (right), senior manager of HISD’s Warehouse Operations. Comerica Bank today announced a donation valued at approximately $40,000 of work stations, chairs, file cabinets and other office equipment and supplies to the Houston Independent School District (HISD) to be dispersed to classrooms across the city. The office equipment and supplies, surplus from Comerica’s recent Houston market headquarters relocation to Brookhollow Central, will be stored temporarily at a HISD facility where teachers and school officials then can come and select items to use in their classrooms and school offices. HISD’s Nicole Ware Smith, Senior Manager of Warehouse Operations, said, “Our schools are very excited about Comerica’s furniture and equipment donations. We are always looking for opportunities to obtain used furniture that’s in good serviceable condition because some of our schools have special needs. These are schools that are new, schools that have been damaged or ones that have recently undergone construction. This furniture and equipment will go a long way in helping improve conditions for student instruction. “The donated furniture and equipment will be made available on a first-come, first-served basis. So, I know teachers will be lined up once word gets out that it’s available,” Smith added. This entry was posted in Uncategorized and tagged classrooms, Comerica Bank, donation, office equipment on May 14, 2012 by HISD Communications.